Dko Architects handed H2O Designs a brief that asked for a complete design and manufacture of the South Melbourne terrace. The architects terrace floor plan provided us with a general guide to work to but other factors like the modularity and weight of components, lighting, planting and lift only access were all considered. 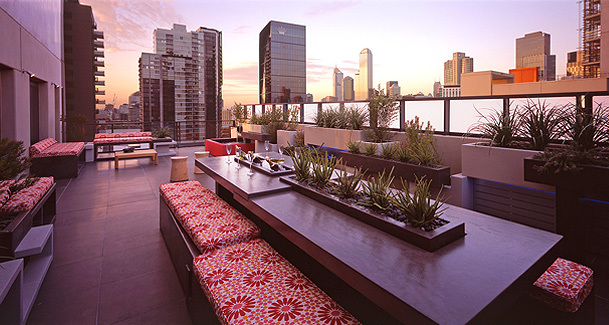 With rooftop garden design it’s important to visualize finished components in their surrounding environment. Hand drawn 3D concept sketches are a quick and effective way to assess the success of a design, especially when there is a range of components as seen in this project. Different styles and layouts can all be trialed. The manufacturing process of modular/intersecting components begins by building each segment in 3D Cad software. Using site dimensions as restricting points each piece and adjoining piece is built to scale, highlighting any possible issues and resolving them before components have reached a later stage in manufacturing. This rooftop is situated above a very busy Melbourne corner and for this reason crane access was not an option for the delivery of the components. Each piece of this puzzle was designed to be hand delivered through the buildings lift access and apartment doorways then positioned and installed on site using simple tools. 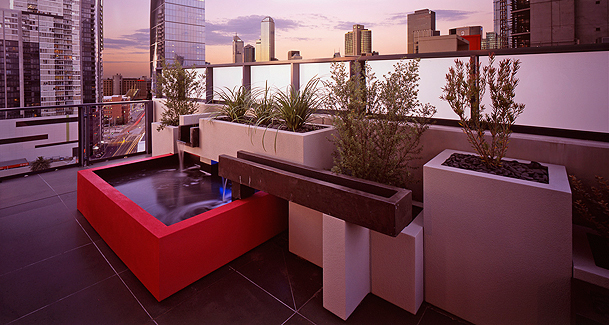 Nestled within some of Melbourne tallest apartment buildings this rooftop garden features a number of lightweight architectural products that turn the terrace into a refreshing retreat from the hustle and bustle of the city. All the architectural products were designed to suit the lift access to the building. The design features a table to seat 12, balustrade planter boxes, seating with planter boxes/ice trays incorporated, water feature, bbq area, decorative walls and lighting. A mixture of dark oxide polished concretes and texture finishes are combined to create a natural color that works in with the shades of the building.